THE BENELUX MARKET CONTINUES TO GROW FAST. The Hague estimates that the Benelux biomass pellets consumption will double during the period 2012 – 2020 to a volume of 5.7 MMT (US$ 1 billion). For the supply, the Benelux will depend for over 95% on imports. In 2012, the United States was the main supplier of wood pellets to the “Benelux “(Belgium, the Netherlands and Luxembourg) market with an export volume of about 1.25 MMT (US$ 225 million). If trade flows remain consistent with current patterns, the United States has the potential to supply at least half of this import demand. However, wood pellets will need to comply with sustainability requirements. Differences in production and consumption characterize the European pellet market. The market can be divided in three regions. The market around the Baltic Sea, with Sweden as major producer and consumer, and Russia as major supplier. The market in Central Europe, with Germany, Austria and Italy as both major producers and consumers. And thirdly, the North Sea region, with the Netherlands, Belgium and the UK as major consumers without any significant domestic production. The Dutch, Belgian and UK market are dominated by large-scale power plants, and mainly depend on imports from the United States and Canada. 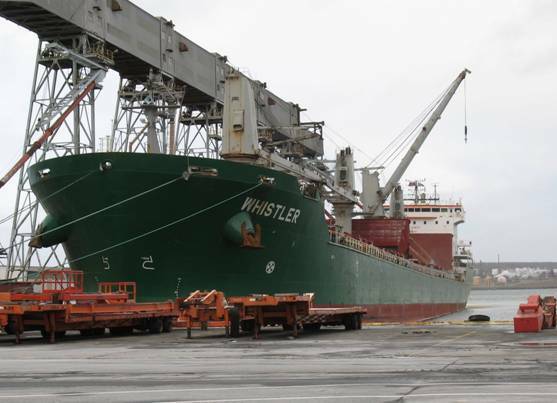 The ports of Rotterdam, Antwerp, Ghent and Delfzijl are anticipated to serve as a major logistical hub for the Benelux biomass market and potentially for other regions in the EU. To facilitate the trade in biomass, Endex Wood Pellets, the world’s first industrial wood pellet exchange was established in 2011, and is located in Amsterdam. From this point of view, the constant growth in the use of pellet and increased demand from European countries, is a big opportunity to developing countries to become in biomass’ suppliers. APRIL 2013. United States report on BENELUX MARKET: In add at this cause, today in USA the most quantity of wood pellets are used in residential heating boilers, resulting in an increased local consumption, with a risk of will not have enough biomass to supply the demand of Benelux market. This is the first advantage to expand the market toward developing countries. More evidences? Find them here: Benelux pellet market to double by 2020. 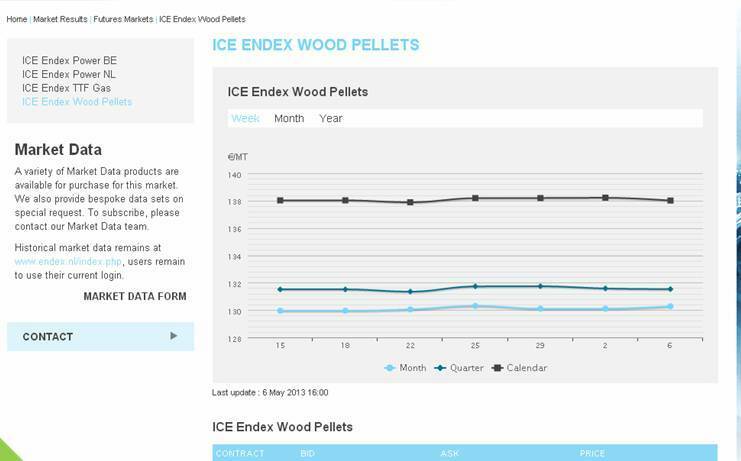 ICE Endex Wood Pellets settlement prices are based on delivery CIF Rotterdam and are derived by means of the pricing panel methodology. Data delayed at least five minutes. This is Jeff from Korea but I stay in Thailand. I shown your company website and I would like to ask your company can supply wood pellet for us. Surely, we also have a lot of customers in our market such as power plant, industrial company, distributor etc. If you can supply regular quantities for us, we will do our best to introduce your product in our market as your partner. Pls give us your available quantity with price based on FOB your loading port. Thanks and hope to get your positive reply. EN+ A2 wood pellets, spruce/pine, 8mm, Ash 1%, 4900kcal/kg, 17.5GJ/t. Certified by Incolabs/SGS. Stock available for exports – 6200 t. Year contract 35.000 t.
Shipment: FOB (St.Peterburg), CIF (Hamburg), CIF (ARA) or other port.